When we think of an auto accident, we normally think of one car hitting another car or truck, or perhaps a collision involving multiple vehicles. While this certainly accounts for most of the car accidents we see in the greater Boston area, there are other types of accidents. According to a recent news article from CBS Local Boston, a man was killed when the pickup truck which he was he was driving was hit by a commuter rail train operated by the Massachusetts Bay Transportation Authority (MBTA or “T”). The driver of the truck was 78 years old at the time of this death.Authorities have said the crash occurred around 8:20 p.m. at a railroad crossing. There were 10 passengers on the train, as well as the train crew, and none of them were injured in the collision. When first responders arrived at the scene, they found the victim non-responsive, and he was soon pronounced dead on the scene. The police have said they do not believe there was any foul play involved in this deadly Boston area car-train collision. Crashes involving a commuter rail train or a freight train and a car or truck most commonly occur at what are known as level crossings. A level crossing, as the name implies, is a railroad crossing in which the train crosses a road designed for vehicle traffic. There is typically some sort of mechanism to alert cars that a train is coming, and, in most cases, gates to physically block vehicles from entering the tracks. However, as we have seen in various systems over the years, things do not always work like they are supposed to. The reason these level grade crossings exist is because they are a lot cheaper than the alternatives. An alternative is an overpass for either train or perhaps the cars to travel on so that the tracks are not level with the road. 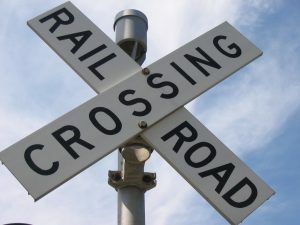 It should be noted that even if there is a slight incline, it is still considered a level crossing, although they are actually the most dangerous types of railroad crossings. In the case of vehicles with long wheel beds like a bus, the front wheels of the vehicle can pass over the crossing and then the rest of the undercarriage gets hung on the tracks. This will usually require the passengers and drivers to exit and get to safety before a train arrives. There will hopefully be enough time to warn the railroad to stop the train, as there is no quick way to remove the bus. Normally a large tow truck with what is known as a rotator arm is required to lift the bus off the tracks. Before we get into the liability issues in terms of a crash involving a train and a personal vehicle or truck, it is important to understand why these accidents occur and why they are so dangerous. Everyone knows a train is big, but when you actually think of the size in terms of weight, the numbers are quite shocking. A standard freight train that is not loaded with extra heavy freight could easily weight 8,000 tons or 16 million pounds. On the other hand, the average weight for a car is around 4,000 pounds, with many cars being much lighter than that. When you think of the amount of mass hitting a much smaller object, it is not hard to see how much damage can occur. While some trains can travel upwards of 200 miles per hour, they rarely do due to federal regulations that limit speed of trains to around 40 to 70 miles per hour unless certain specialized blocking equipment is used. Even at these relatively slower speeds, it takes a train much longer to stop than a car. While an average personal vehicle can stop in about 200 feet, a train takes over one mile to come to complete stop, and this is after the train engineer sees the obstruction on the tracks and fully applies the brakes. It takes longer to apply the brakes on a train than it does to step on the pedal of a car. This means that if there is a car stopped in the path of a train, there is not much the engineer can do to avoid the collision, as he or she cannot slow down in time, and he or she obviously can’t turn. Unless a driver of the car raced or otherwise drove recklessly to rush through the gates to “beat” the train, then something likely went wrong that is not necessarily the driver’s fault, and that could make it the fault of the train operator, an equipment failure, or possibly another car. One thing to keep in mind, however, is that a lot of times there will be a line of traffic going through the railroad crossing. There will sometimes be a line of cars on the track. The first thing to keep in mind is that you should never enter a railroad crossing unless you are able to clear that crossing fully and get to the other side safely. If there is a line of cars waiting to cross the tracks, you should not enter the crossing. This also true at intersections. If however, your crossing equipment doesn’t work properly and does not block your entry, or perhaps the arm lowers in a time that is unreasonable for you to fully clear the tracks, then you would not be liable. This means that another party would be liable, but the question would be who that party is. For example, it is possible section or tracks are owned and operated by the MBTA. However, there is also a possibility that Amtrak owns them. The most likely answer is that they are owned and operated by a freight company and the commuter rail system and other passenger lines like Amtrak are paying for the right to use those tracks. This is because, after the Second World War, many of the railroad tracks were sold to private companies. A large reason for this was actually to make the tracks less accessible so that cars and buses would become the norm for interstate travel, as opposed to trains in Europe and much of the rest of the world. If we are dealing with a government agency, you attorney can explain that a legal doctrine known as sovereign immunity may come into to play that offers some protections to government agencies. However, this can be a very complicated issue, so you want to make sure your attorney has experience dealing with these types of cases. There may also be various federal statutes that come into play, as you can discuss with your attorney.